The Professional Core Training Ball by Yoga Direct is an affordable way to get fit -- fast! Our 8 inch core ball arrives deflated to save on shipping. Simply inflate by mouth to blow it up. This ball can be used to enhance several abdominal workouts, Pilates routines, and core repetitions. It can also be used for resistance/strength training. The soft surface is textured to retain stickiness through perspiration. 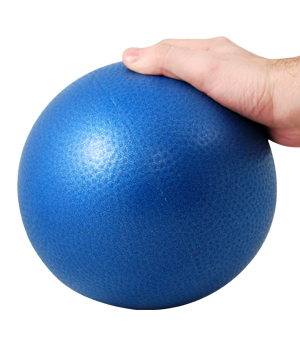 Our Core Train Ball is 8 inches in diameter and squishy, so it's easy to grip and hold onto. This item is priced wholesale -- buy in bulk for added savings! Our Professional Core Training Ball is one of our most popular items! That's because yoga and Pilates practitioners realize the benefits of using fitness balls for core exercises. This 8" diameter, textured core training ball is inflatable so you can adjust the tension. No pump needed. I don't know if I'm putting this to the best use, but I find it beneficial for abdominal stimulation, rolling it under my belly and expanding my belly into it. I like the size and squishiness of it, and that I could inflate it without a pump. Quality ball at an affordable price. My students and I are very happy with the product. The price was amazing and the effects are even better! I...love..this...ball!!!! These balls are durable and easy to inflate! Good ball. Sturdy. I am happy with this purchase. This is a great ball to use for core taining after back surgery. I just wish it were a little larger. These core balls are perfect for my yoga barre class. They are a perfect size for core work and putting between the legs for a more intense leg work. The material is strong and my students love training with them! The core training ball are great! Brought a dozen for my studio and everyone loves them. Easy to blow up too. My students love these! They are easy to fill which really helps. A bit bigger than I expected, but the soft touch and easy grip makes all the difference. A great aid in exercising. strong and soft, can be held in one hand. I also use it for stretching my back.